I’m 9 years old in the 19th century. That’s how I feel. I love the smell of ivy, fresh flowers and especially the short blades of green grass soft under my feet. I’m beaming under the blue sky and passing clouds of England. Adoring crowds of people are gathering around me. They say the nicest things to me. They are gentle, polite but also wickedly funny, and they fit my sense of humour perfectly. It’s July 9, 1877. Queen Victoria is empress of India. Crazy Horse has fought their last battle with the US Cavalry in Montana, and Sitting Bull and his band of Lakota are on the run. A trailblazing group of writers working in a new medium called “journalism” have a new tool — the telephone. On July 9, the first ever Wimbledon tennis championship begins. Male singles only. I, Roger Federer haven’t been created yet. But a tournament — a garden party really — has been created for me. In 1940, the Nazis bomb Centre Court, blowing apart benches where journalists will sit in the press box watching me, still using their 1877 tool, the telephone. Now I’m nine years old in the 1970s. Bjorn Borg is playing with a Donnay racquet, and I hope my parents will buy me that one. 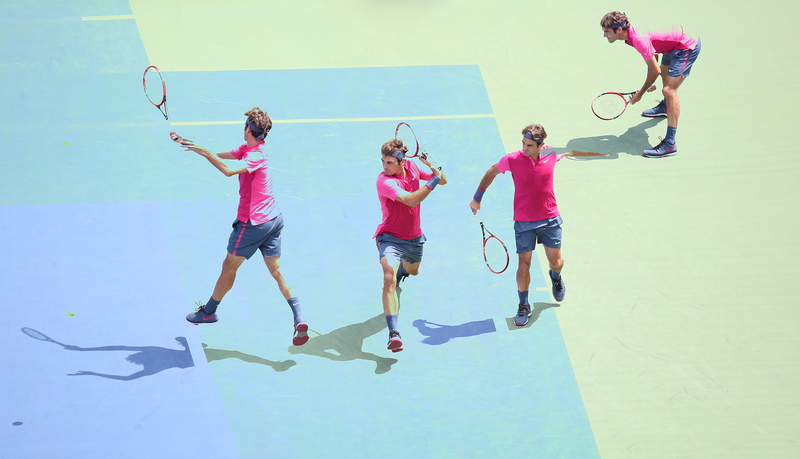 He floats above the grass on Centre Court, running down balls side to side. I want to do that. He’s using something called “topspin”. I’m trying to figure out how he does that. Then he uses “slice” — backspin — to keep the ball low and make his opponent miss. He hustles to the net and finishes the point with a “volley”. By watching, I figure out this means he hit the ball out of the air before it bounces. I want to try that too. Now it’s the 1990s. Pete Sampras is playing with a Wilson racquet, and I want that one too. His serve is so effortless and accurate. He can serve all day. He’s usually on the attack, dictating points and finishing at the net when he can. I want to do that too. Now it’s 2017 and I am still really only nine years old. I dream. I believe. I’m doing what I love. I love how the ball feels on the sweet spot of the strings. I love watching the spray of white powder when my shot hits the line. I love carving my way through the draw against guys who are bigger and stronger than me. I love the feeling of winning with my parents, wife and children watching me. I love how people are still gentle, polite and nice to me, just like in 1877 and 1922. Things have changed, such as a retractable roof and comfy green seats, but the essence of 1877 remains. I feel it everywhere, watching action on three or four courts side-by-side, with spectators right next to the players. I love the silence of 15,000 people in the cathedral of Centre Court, and the sudden pop of a champagne cork, or the total silence before the spontaneous eruption of delirium when I win the point. I never want to leave this place, actually, where I’m still a boy in the 19th century. THE MODERATOR: Ladies and gentlemen, the 2017 Wimbledon champion, Roger Federer. Questions, please. Q. Back to 2001, beating your idol Pete Sampras, to this day lifting your eighth trophy, can you imagine ever doing this? ROGER FEDERER: No, I didn’t think I was going to be this successful after beating Pete here. I hoped to have a chance maybe one day to be in a Wimbledon finals and have a chance to win the tournament. Winning eight is not something you can ever aim for, in my opinion. If you do, I don’t know, you must have so much talent and parents and the coaches that push you from the age of three on, who think you’re like a project. I was not that kid. I was just really a normal guy growing up in Basel, hoping to make a career on the tennis tour. I guess I dreamed, I believed, and really hoped that I could actually maybe really do it, you know, to make it real. So I put in a lot of work, and it paid off. Q. The changes you made to be back on this stage after leaving the tournament here last year with a lot of doubts. ROGER FEDERER: Honestly, it was all based on health. It wasn’t about the game itself, how I should play when I come back to Wimbledon this year. It was all just put myself in a good physical state that I could compete with the best and play seven times five sets. That was my goal. I achieved that. When I showed up here in Wimbledon, I was actually already very happy. Q. In your on-court interview, you said, I hope to be back, I hope this is not my last match. What assurances can you give, barring any bath-related incidents? ROGER FEDERER: We never know what happens (smiling). Q. Is it your intention to be back next year? Or do you get to the end of this year and see how the rest of it goes? What’s the process? ROGER FEDERER: Honestly, ever since I had the year I had last year, I do think probably like a year ahead of time, you know, with my schedule, fitness schedule, tournaments I would like to play. So I totally see myself playing here this time next year. But because it’s far away, because of what happened last year, I just like to take the opportunity to thank the people in the very moment, and make them understand, yes, I hope that I’m back. There’s never a guarantee, especially not at 35, 36. But the goal is definitely to be here again next year to try and defend. Q. You often have spoken about not worrying about records. That’s not what motivates you. ROGER FEDERER: Well, I didn’t quite say that like that, like I don’t care. I said it was a great extra motivator. It was. Q. Is there something particularly special about getting to eight at Wimbledon, where it was your first, that no one has ever achieved that number for the men’s championship? ROGER FEDERER: Yes, it is very special. Wimbledon was always my favorite tournament, will always be my favorite tournament. My heroes walked the grounds here and walked the courts here. Because of them, I think I became a better player, too. To mark history here at Wimbledon really means a lot to me just because of all of that really. It’s that simple. Funny enough, I didn’t think that much of it throughout today, throughout the trophy ceremony. I was more just so happy that I was able to win Wimbledon again because it’s been a long road, it’s been an exciting road. It’s been tough at times, but that’s how it’s supposed to be. So to be Wimbledon champion for an entire year now is something I can’t wait, you know, to savor and just enjoy. So it was super special. Number eight obviously means a lot to me because at that level, to be part of Wimbledon history, is truly amazing. Q. You said you’re not looking too far ahead. In terms of this season with how things have gone, do you perhaps now reassess your goals in a different way, whatever goals you had before, and maybe change them? ROGER FEDERER: I don’t think so. I was always going to play more the second part of the season. I wasn’t going to skip entire swings. I wasn’t going to skip Asia, the American tour, whatever it was, the European indoors. I was always going to play as much as I possibly could. So I think I’m going to stay true to that. Now we have to sit down tomorrow and decide what we’re going to do with Canada or not. But most likely I’ll definitely play Cincinnati and the US Open, Laver Cup, Shanghai, then go back to the indoors. That’s the plan for now. Q. Your former coach Stefan Edberg always said you could get the Grand Slam title again. Did you continue to believe getting Grand Slam titles, Wimbledon title again? ROGER FEDERER: I truly believed, you know. For me it was also important that my team believed it, as well. It wasn’t like just me trying to carry the team; I need the team to carry me most of the time because that’s the few percent that the team makes a difference. Maybe when you’re doubting yourself, they reassure you. If you’re feeling too good, they make sure you come back to planet earth and put you in your place. That’s where I think I have a wonderful team. I did ask them the question sincerely, to everybody on my team, if they thought I could win majors again or if I could win the biggest tournaments or if I could win against the best on a regular basis. Basically the answer was always the same from them: that they thought if you’re 100% healthy and you’re well-prepared, you’re eager to play, then anything’s possible. But if those things, those components are not working, it’s going to be extremely difficult. That’s how it also played out, so they were all right. I believed them. I had the same feeling. I think that’s why the break last year was necessary to reassess and get back to 100% physically. Q. A question that might be difficult to answer. I’m sure you can talk about your opponents, how great they are, their abilities. Can you take a step back and tell us why you have been so great in your career. What are the physical abilities, the mental abilities you have that you feel allow you to achieve these great records? ROGER FEDERER: I think at this stage it’s really consistency. I’m not shying away from the big stage. I’ve always been a big-stage player. I always felt like I played my best on the biggest courts. I struggled on Court 18, to be honest, because of whatever reason it was. I just didn’t feel I hit the ball as good there than on Centre Court. That was always going to be a good thing, if I played the best players, or in the bigger matches, that that would serve me well. I felt like I dreamed pretty big as a kid. I believed that maybe things were possible that maybe others thought were never going to be achievable. That helped me. Then I just think I trained really hard and really well and very clever over all the years. I go back to my first coach, to my coaches today, and the same thing with fitness all the way to today: I think every step of the way I always had the right people. Then I had a wonderful, you know, amazing people around me in my wife today, my parents, who always kept me very grounded, you know, kept me the person I am still today. Then in the game, I guess, yes, I was blessed with a lot of talent, but I also had to work for it. Talent only gets you that far really. Q. You always had very high standards even when you were young. You said when you were 15 you should be able to play a perfect match. Strictly speaking that’s not going to happen. ROGER FEDERER: Not at 15 anyway. Also not at 35 (smiling). Q. Talk about what’s been happening this year and this tournament, where you didn’t lose a set. There’s a level of excellence that’s just incredible, especially for where you are in your life. Does it surprise you? ROGER FEDERER: Yeah, honestly I’m incredibly surprised how well this year is going, how well I’m feeling, as well, how things are turning out to be on the courts, how I’m managing tougher situations, where my level of play is on a daily basis. I am surprised that it’s this good. I knew I could do great again maybe one day, but not at this level. So I guess you would have laughed, too, if I told you I was going to win two slams this year. People wouldn’t believe me if I said that. I also didn’t believe that I was going to win two this year. But, yeah, it’s incredible. I don’t know how much longer it’s going to last. I have no idea. But I just got to always remind myself that health comes first at this point. If I do that, maybe things are actually possible I didn’t think were. Q. You’ll be 36 in a couple weeks’ time. ROGER FEDERER: That reminder again (smiling). It’s all good, no problem. Q. As you said, health permitting. Health permitting, is it possible you could still be playing here when you’re 40? ROGER FEDERER: I mean, you would think so, if health permitting, and like you say, everything is okay. You could take 300 days off beforehand, just prepare for Wimbledon, put yourself in a freeze box, then you come out and train a bit, you know you’re not going to be injured. Yeah, playing Wimbledon and winning Wimbledon are two separate things. Don’t forget that. The problem with not playing, you take a chance on your health, too, in some ways, because matches actually are the real – what do you call it – the measuring stick. Because you can practice as good as you want, you can feel as good as you want in practice, but when the pressure comes in the matches, the nerves, the stomach, how you feel it, everything that happens like today before the match, you can’t recreate that in a practice. You don’t know how your body is going to react to that kind of pressure when you’re moving, you’re not free, you’re tense. That’s why you always need to have the right balance between practice, matches and vacation. At some stage you have to play a minimum of matches, otherwise you’re just not going to be successful any more. That’s going to be the interesting thing moving forward, how I’m going to be able to manage that. Q. On today’s match, was it a slightly strange atmosphere at times because of the struggles on Marin’s part? Did you change your play or your mentality because of what was happening on his side of the net? ROGER FEDERER: Well, I didn’t really feel — I couldn’t tell you right now, and I don’t know what his problem was really, to be honest. I couldn’t tell you if he was struggling moving to his forehand or to his backhand. Because he was serving big. He was serve and volleying. So I guess movement for that reason wasn’t the biggest problem maybe. I thought when he called the doctor first, I thought maybe he was dizzy or something. Because I couldn’t tell what it was, it actually made things easier. If I saw him limping around, or if I saw him pull up hurt in some place, I would start to think, Okay, maybe I’ll throw in a dropshot to really check him out, then want more, because that’s what you do (smiling). You need to hurt him, you know, where it hurts already. Because I didn’t know and I couldn’t tell, I just said, Focus on your game, focus on your match, keep playing. The good thing is I was already in the lead. But, yes, the atmosphere, of course it’s not a five-set thriller, people want to see a tighter match. I totally get it. But, you know, I’ve had those. I’m happy it was different today. Q. What keeps you going? Would you advise Andy Murray to follow your route in resting a bit more? ROGER FEDERER: Look, he’s younger. He has a different practice regime than I have, I’m sure. It doesn’t mean he’s practicing more or less. It’s just different. He’s had a different upbringing. Everything is different. It doesn’t mean because I took a break that everybody should take that break, to be quite honest. Some players just need to play. They need to play every other day, otherwise they feel like they completely lose touch with the racquet and the ball, you know, the body goes all funny on them. I think it’s only himself with his team who knows best. I can’t give any advice in this regard. But for me, a break really worked wonders now. I am still surprised it did as much as it did. I had to take some tough decisions along the way, like pulling out of the French, pulling out of the clay court season. This is not just — now in hindsight it looks so simple: You just do that to win Wimbledon. But it’s not. I’m sure he’s going to take the right decisions moving forward. He’s still got a lot of years left to play if he’s in the mood for. We’ll see a great Andy Murray moving forward. ROGER FEDERER: What keeps me going? I don’t know, I love to play. Wonderful team. My wife’s totally fine with me still playing. She’s my number one supporter. She’s amazing. Yeah, I love playing the big stages still. I don’t mind the practice. I don’t mind the travel. Because I’m playing a little less, I actually get more time in return. I feel like I’m working part-time these days almost, which is a great feeling (smiling).